For almost a century, CKUA has been part of Alberta’s story. And as the province has grown, so has the station. From our studios, we keep our listeners connected to the best in arts and culture in Alberta. But our studios are more than just places from which to broadcast — they are also where we connect with our history and with our community. 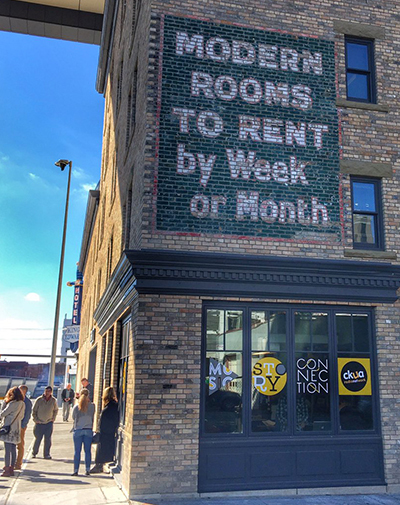 CKUA broadcasts from heritage buildings in two of Alberta’s prime cultural hotspots: the Alberta hotel in Edmonton’s arts district, and at Studio Bell on Calgary’s Music Mile. Come find out a little bit more about these unique spaces. CKUA occupies a unique part of Alberta’s history, so it’s fitting that we make our home in one of Edmonton’s most unique buildings. The Alberta Hotel was first built in 1883 as a saloon and billiard hall, becoming one of Alberta’s most modern and sought-after hotels. Prime Minister Wilfred Laurier stayed at the hotel on the eve of his declaration of Alberta as a province in 1905. Torn down in 1984, the Alberta Hotel was eventually rebuilt by Edmonton architect Gene Dub. And in October 2012, CKUA moved from its aging (and probably haunted) home at the Alberta Block, to the custom-built new Alberta Hotel. Home to CKUA’s Main Control broadcasting studio, the building also has a full-scale studio equipped for video and audio recording, as well as voicing booths and production studios. The Performance Space has floor-to-ceiling glass walls, providing an impressive backdrop for the live concerts and events hosted there. The basement of the building houses CKUA’s climate-controlled music library — a massive collection of more than 1.5 million albums, CDs, videos and other forms of music. No other floor was structurally strong enough to bear the weight of the collection. In fact, it’s so big that it needs its own page. CKUA respectfully acknowledges this building is located in Treaty 6 territory and in Métis Region 4 territory, a traditional gathering place and home for many Indigenous peoples, including the Cree, Niisitapi, Anishinabe, Stoney Nakota, Dene, Métis and Inuit peoples. 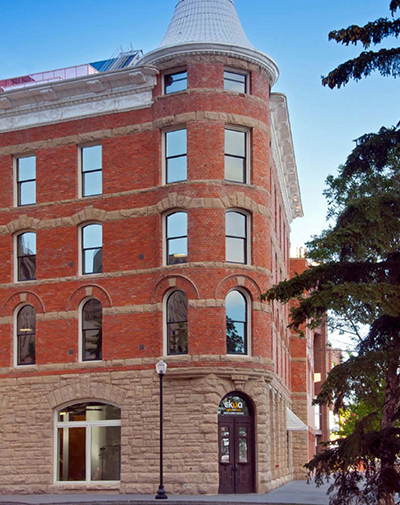 Our Calgary home is the perfect fit for CKUA — nestled within one of the city’s historic live-music venues, and part of a larger centre that connects Canadians with music. The Calgary Foundation CKUA Studio is located in Studio Bell, home of the National Music Centre. The King Edward Hotel was one of the first hotels built in Calgary, along the notorious “Whiskey Row.” In the 1970s and 80s, the King Eddy became Calgary’s premiere blues bar, pulling in big-name performers from all over the world. Eventually the bar closed down and the building was abandoned. But in 2016 the King Eddy was restored and is now the centerpiece of the newly-established National Music Centre. It is once again a live-music venue, part of the city’s Music Mile — and the home to CKUA’s street-level Calgary studio. For a comparatively tiny space, CKUA’s Calgary studio is a powerhouse, broadcasting a third of CKUA shows. It’s the hub for our hosts in southern Alberta, as well as the site of many live performance and open houses, keeping us connected with our Calgary supporters. CKUA respectfully acknowledges this building is located in Treaty 7 territory and in Métis Region 3 territory, traditional home for many Indigenous people, including the Niisitapi, Stoney Nakota, Tsuu’tina, Piikani, Cree, Dene, Inuit and Métis people. 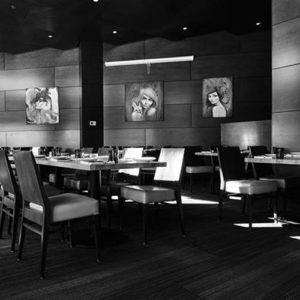 Located on the ground floor of CKUA’s Alberta Hotel, Revel is a contemporary bistro and bar that focuses on modern interpretations of classic flavours. It boasts a gorgeous indoor dining space and lounge, with a focus on quality food and a relaxed atmosphere. It’s also the perfect summer spot to grab a drink on the patio, with views of downtown and Edmonton’s river valley. 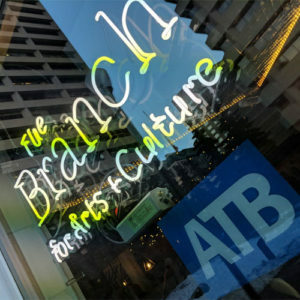 A mix of live venue, gallery and financial institution, ATB has set up a one-of-a-kind space in the lobby of CKUA’s Alberta Hotel. Staffed by people who know banking and are artists themselves, it focuses on financial services geared towards creative and cultural workers in Alberta. Plus, they host some pretty cool events in the the space! It started as a collection of keyboards in the 90s. Now it’s a can’t-miss for Canadian music fans. 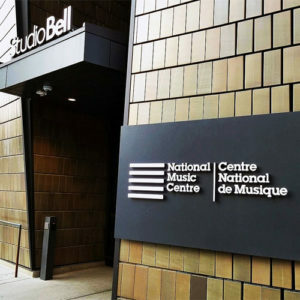 The National Music Centre hosts an extraordinary collection of musical history from across the country and the rest of the world. But it’s not just focused on the past – the NMC also hosts live performances, as well as offering artist development and education programs to inspire the next wave of homegrown musical legends.